"He was the other half of me," his fiancée said. "Spiritually, physically mentally." The fiancée of a man who was killed after stopping to help a crashed driver on the Pine Valley Creek Bridge Wednesday said her husband-to-be was the kind of guy who would help anybody at any time. "Oh God, no," Gwendolyn Sneed said, answering whether or not she was surprised by the circumstances of her fiancé's death. "It didn't surprise me at all. It makes me laugh and cry at the same time. It was totally him." Robert Verlin Bruno, Jr. was found dead Wednesday morning under the Pine Valley Creek Bridge which spans some 400 feet in the air. The California Highway Patrol said Bruno, 48, stopped to help a driver in a Chevy pick-up truck who spun out on a patch of ice on westbound Interstate-8 and crashed into the bridge's railing sometime before 5:10 a.m. Moments later, another truck swerved to avoid the first crash and collided with a Kia Sorento. A fourth car then slammed into the back of the Kia, CHP said. In an attempt to avoid the oncoming cars, Bruno ran to the side of the bridge and jumped over the rail, CHP said. The bridge in San Diego's East County is one of the highest in the U.S. Bruno did not survive the fall. Officers on scene initially thought the good Samaritan, who was driving a Subaru, may have crashed into the spun-out truck and was ejected from the vehicle. Officers later learned Bruno had stopped to help the stranded driver. "He was a guy who would help anybody at any time," Sneed said. "He was the guy who would walk by someone who looked down and out and give him this leftover food." Sneed said she's experienced a rollercoaster of emotions since learning of Bruno's death and doesn't really know what she's supposed to do next. "He was the other half of me," Sneed said. "Spiritually, physically mentally." Bruno's body was found in a snow-covered canyon under the bridge by a chopper that was weaving through support beams during the search. He just celebrated his 48th birthday two weeks ago. While the chopper spotted Bruno just before 7 a.m., crews were still coming up with a plan to retrieve the body hours later. 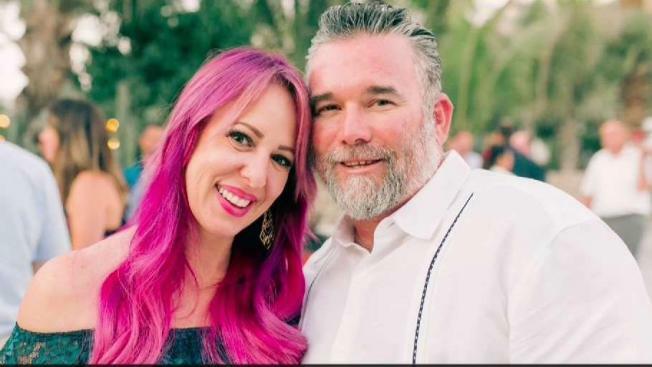 Sneed says the couple lives in Jacumba Hot Springs, about 75 miles away from San Diego, and both made the daily hour-long commute to work in the city. She says her fiancé was always concerned for her safety on the roads when winter weather came and would constantly remind her to drive safely. She said it was raining the night before and snow was on its way. "He definitely warned me to be careful," she said. Between bedtime and 5 a.m. when Bruno left their house for work, snow had fallen. Sneed said she was still cozy in bed and no cautious advisories were exchanged that morning. "It snowed early that morning. There was black ice on the road and that's ultimately what killed him," she said. Sneed described Bruno as the type of man who could command a room -- an unfiltered, "totally authentic" man who respected everyone and got nothing but respect back. His skills in the kitchen and in his garden were a few that stood out to Sneed, and she said she's sharing her grief with their amazing families and friends. According to Sneed, Bruno was an installation manager at a business called Life Deck and like to restore cars and ride his motorcycle in his spare time. He has a 28-year-old son living out of town who Sneed says they raised together since he was nine. People at Major's Coffee Shop in Pine Valley told NBC 7 they know all about the dangers on the highway when freezing temperatures hit. Debi McNamer, owner of Major’s Coffee Shop, said she's been driving around town at 5 mph to avoid sliding on the icy roads. She and others at the coffee shop were heartbroken to learn about what happened to the good Samaritan. The other victims involved in the crash, including a 4-month-old infant, were all believed to be accounted for, firefighters said. Only minor injuries were reported but medics did transport one person to the hospital. The crash on the bridge leading to and from the desert happened after about a week's worth of rain and snow from three separate storm systems. At 450 feet tall, the Pine Valley Creek Bridge is the 11th highest bridge in the U.S., according to World Atlas. While rain had cleared Wednesday morning, forecasters warned that roads would remain icy for several more days. CHP said conditions on the bridge at the time of the crash were foggy, icy and snowy. A CHP officer told an NBC 7 News crew the bridge conditions were so unsafe reporters could not be on it. Caltrans crews dumped a truckload of sand to de-slick the roadway enough to remove the vehicles after the crashes. During, traffic was reduced to one lane on westbound I-8.